Photo by Terry Fitch of Wild Horse Freedom Federation. We must relentlessly call Congress until they ask for mercy and remove the two offending sections legalizing wild horse killings and enabling horse slaughter in Appropriation Bills. Focus on all the member of the House and Senate appropriations committees but also contact your own Congressman and two Senators. This is because, in all likelihood, the two pro-slaughter sections (one removing the USDA slaughter inspections ban and other adding language to allow BLM to kill and sell for slaughter wild horses in holding) will be passed by the appropriations committees since western pro-slaughter folks have the majority and they have already discussed the matter and have allegedly agreed to pushing this to the full Congress to bring horse slaughter back. In my humble opinion, it is a done deal. – Ask them to vote no on any language allowing the killing of wild horses in holding and/or their sale without limitation, that is, for slaughter or “processing into commercial products” as they like to call it. Cheltenham race, April 2019. Even if you’re not entirely invested in betting on horse racing, the opportunity to bet on some of the bigger race meetings is something that a lot of people will take an interest in. Enjoy race assistance at Cheltenam betting offers. The markup session where both bills (agriculture and interior) text will be formally redacted and introduced is WEDNESDAY July 12th. Make sure you keep calling and writing until these two languages are killed for good. Information supplied by Daniel Cordero Fernández. Terry Fitch of Wild Horse Freedom Federation at Palomino Valley. Colorado Springs, CO – The Cloud Foundation received an anonymous tip that Department of Interior Secretary Ryan Zinke and/or top Bureau of Land Management officials have ordered all wild horses currently in short term holding facilities be categorized by weight and age in anticipation of the approval of the federal budget. The current recommendation for this budget would allow for “sale without limitation” many or most of the wild horses currently in holding. This, of course, can eventually lead to the barbaric slaughter of our iconic wild horses. The tipster stated that this categorization was to ensure the BLM was ready to “ship out” horses older than five years of age. The only place to “ship out” these horses would be to slaughter. The caller stated that the shipping would start with the smaller facilities so that wild horse advocates wouldn’t be able to impose an injunction before the plan was already started. Although anonymous, the caller also told The Cloud Foundation that direction has been given to the one of the government’s top transportation officials to prepare for this shipping. The persecution of our nation’s wild horses is at an all-time high, and it is disgusting to hear the Bureau of Land Management’s reasons for wanting to wipe out these American Icons. They have said on multiple occasions that they have no other options than to slaughter the horses that they round up – but there are many other alternatives that they refuse to entertain, because they just want this “problem” to go away so that they can appease the special interests in the swamp in Washington. This is not a complicated issue, and it is absurd that our government insists on wasting time and taxpayer money when we stand ready to come in and fix this issue for them. We have the tools and resources to make this right, and we are ready and willing to work with the new administration to solve this issue once and for all. For years, Madeleine Pickens, Founder of Saving America’s Mustangs, has been working tirelessly, and investing millions of her own money into creating a sanctuary for America’s wild horses, Mustang Monument. Yet, despite her continued efforts, the BLM refuses to work with her, and instead have opted to implement copious roadblocks to keep her from operating her sanctuary, and sharing the wonder of these animals with the public. Join us as we address Secretary Zinke directly, and tell him that we, the American people, are unwilling to allow this administration to slaughter tens of thousands of innocent horses, when we have real, sustainable alternatives available NOW. Our wild horses need a voice, and our government needs a solution – we ARE that voice, and we ARE that solution. Say NO to slaughter. Wild Horses Killed for Their Meat? If we don’t act now, thousands of America’s iconic wild horses may be culled — or sold off to meat slaughterhouses in Mexico and Canada, where torture and painful death await. No horse’s life is “excess,” and these animals do not deserve to be rounded up, slaughtered, and sold for meat just to give more land to rich cattle ranchers, as many speculate will be the case. Sign the petition to tell Interior Secretary Ryan Zinke that he must prohibit the slaughter and sale of America’s wild horses. Thousands of horses’ lives depend on it! The Department of the Interior, under the leadership of Secretary Ryan Zinke, has signaled its intention to strip decades-old federal protections for wild horses and burros and to allow them to be shipped to slaughter by the tens of thousands. Public comments and Congressional testimony from Zinke and other high-ranking government officials represents the most severe threat to wild horses since the ghastly and cruel killing practices of the 1960s prompted Congress to adopt the Wild Free-Roaming Horses and Burros Act of 1971. Turning to mass slaughter would mark a U-turn on the government’s response to wild horse management programs. It was only in April that Congress passed a spending bill with sensible wild horse provisions for the remainder of 2017. That bill included language preventing the Bureau of Land Management (BLM) and its contractors from sending wild horses to slaughter for human consumption. It further directed the BLM to create a plan to maintain long-term, sustainable populations on the range in a humane manner. Now, just two months after President Trump signed the 2017 Omnibus spending bill into law, the Department of the Interior is saying it is going to default to slaughter because it’s possessed with no other options. In the president’s budget request for 2018, the department has asked for the ability to maintain wild horse and burro populations at dramatically reduced levels and to get there by slaughtering the animals. While there are always going to be major challenges in managing wild horses and burros on our western public lands and in satisfying the diverse stakeholders in the debate, there are certain options that should never even be considered because they are simply outside the bounds of how animals should be treated. Mass slaughter is one of those dreadful ideas, an action that flies in the face of the now longstanding prohibition on slaughter and of the instincts of millions of Americans to protect these magnificent symbols of the American West. The BLM has never been exemplary at managing horses. Far from it. For 20 years, the agency’s primary strategy for wild horse and burro populations has largely consisted of rounding up and removing the animals from our public lands – an effort that has resulted in tens of thousands of wild horses and burros being kept in holding facilities at a cost now approaching $50 million a year — more than half of the BLM’s annual budget for the entire wild horse and burro program. Partly because the costs of caring for so many captive horses are undermining the larger program, the agency has failed to commit any additional money to implement sufficient fertility control programs, which have been long recommended by The HSUS and the National Academies of Sciences. The aggressive and widespread use of fertility control is the only way to confront this crisis in the long term. The horses need to be managed, but in a humane manner. Fertility control works, but only if there’s a serious investment in the enterprise on the ground. By preventing the birth of foals, the agency will find itself under less pressure to round up so many horses. Fewer round-ups mean substantial cost savings, since not as many animals need to be pastured and fed in short-term and long-term holding facilities. A capture-and-kill strategy, on the other hand, will only make matters worse, because it will cause the horses to compensate by reproducing at a higher rate on the range. We cannot readily resolve the politics of managing the captive and free-roaming wild horse populations without a struggle. It won’t be easy to get a handle on this. But one thing is for sure: sanctioning the slaughter of tens of thousands of horses is a disgraceful, shameful idea. It is an unacceptable idea that will produce protests in the streets, from Reno to Washington, D.C. Mass slaughter will happen only over the cries, protests, and interventions of the American people. Tell Secretary Zinke that you do not support the slaughter of America’s wild horses by calling 202-208-7351. Dec 14, 2016 — One of America’s most beloved comedians and actors, Chevy Chase, has signed this petition urging President Obama and Vice President Biden to end the slaughter of America’s wild and domestic equines as part of their legacy. We all love Chevy’s performances on television and in film, and his hilarious appearances as one of the original cast members of Saturday Night Live which debuted in 1975. Chevy, his wife Jayni, and their children are all avid horse lovers. We thank them for their support of this petition and ask you to sign and share it as well. Last October, a report surfaced which shows that a Colorado rancher and livestock hauler purchased 1,794 wild horses and willingly and illegally sold each of these magnificent wild animals to suffer a brutal death at slaughterhouses in Mexico. Jun 15, 2015 — Why does France TV 2 report mostly from the side of BLM and pro-slaughter advocates? The United States prohibits mustang slaughter but the same authorities want to limit their number to 25,000 although there are already 50,000 on the land. Sadly the myths reported as truth in the France TV news report were not countered effectively and the good counter points ended up in the trash. The journalists interviewed BLM staff on the range. They met with ranchers who push the overpopulation myth and are pro-slaughter — including Callie Hendricksen. They interviewed Carol Walker, photographer, legal plaintiff and board member of Wild Horse Freedom Federation at a watering hole with a lot of mustangs. The journalists reported on training at a prison program with failed adoptions being the undertone. France TV 2 seems to have heard from all sides of the issue to be fair but who were their handlers? Was it Callie Hendrickson or BLM’s staff over at their America’s Mustang campaign? The news editor crafted the story from the materials shot in the field resulting in the BLM and pro-slaughter viewpoint out in front. The whole story focused on the alleged overpopulation of wild horses in a country that prohibits slaughter with the feds offering $1.5 million to whoever find the lasting solution for population control. Sounds like the BLM pitched this story to push their heinous agenda. The French report shows the advocacy where we are losing the battle… We are split… A portion of the advocacy is supporting the overpopulation myth and offering solutions to the false problem. Are there really too many native wild horses left in the wild? Overpopulation must exist to justify radical zero growth fertility control measures such as PZP, castration, field spaying and slaughter. When wild horse groups support BLM’s overpopulation myth — with advocates pushing PZP as the “solution” to the “problem” — the overpopulation myth gets stronger and is eventually seen as truth. Reporting on myths as truth is a tactic used to sway public opinion — the second largest super power according to the President of the United States. Overpopulation is necessary to justify fertility control, castration and field spaying. BLM has no accurate head counts of wild horses. The National Academy of Sciences stated in their 2013 report that there is “no evidence” of overpopulation, period. Temecula, CA – December 21, 2014 – A devastating number of over 140,000 horses from the United States were sent to Mexico or Canada for slaughter last year according to the Equine Welfare Alliance. Thankfully, this immense figure is decreasing thanks to selfless animal rescues like Villa Chardonnay Horses with Wings, who welcome abandoned and often severely neglected horses with open arms. Many believe that horse slaughter is a humane way of “euthanizing” sick or unusable horses but horse slaughter is a far cry from humane euthanasia. The term “euthanasia” implies that an animal is provided a painless and compassionate death free from suffering. The unsettling truth is that the system is highly flawed, and horses often suffer a brutal and terrifying end. Only a small percentage of these animals are rescued, as there are few equine sanctuaries that can afford to accommodate horses that are completely out of options. Unfortunately, many people overlook the harsh reality and ensuing trauma of the horse slaughter industry. Luckily, animal sanctuary Villa Chardonnay accepts as many abused and abandoned horses they can support, providing them with the love and compassion they never had. Villa Chardonnay, one of the largest and most reputable sanctuaries on the West Coast, has saved 312 animals from a bitter end and provides a permanent home to over 200 animals today. 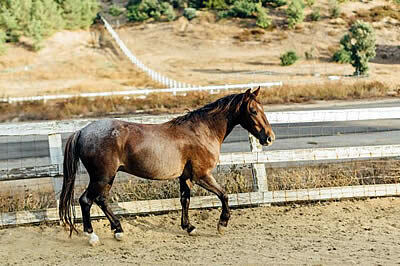 Donations for most rescues in the United States are still down by 50% compared to before the recession, despite the increasing demand of horses in need. Villa Chardonnay’s heart and doors are always open to giving them a permanent home at the sanctuary. As the epidemic of abandonment continues throughout the U.S., so increases the hoof count at Villa Chardonnay. A national capital campaign has been launched to move their sanctuary to a larger location, as the need has become critical. An excellent location has been identified that will allow Villa Chardonnay to become a self-sustaining nonprofit, and an Indiegogo fundraising campaign has been launched. Perks include anything from a polo shirt, to VIP event tickets, up to a 40 acre parcel of land. Visit the Indiegogo campaign page to donate! A year-end matching donation campaign will match up to $25,000 in donations before December 23, 2014. To sponsor one of Villa Chardonnay’s loving animals, visit http://goo.gl/cSpgnk. For more information about Villa Chardonnay Horses with Wings, click here. Visit http://www.villachardonnaypetsupplies.com/about-us/ to learn more about Villa Chardonnay Pet Supplies. Follow Villa Chardonnay on Facebook and Twitter for up to date news.